In a Harvard classroom, Samuel Huntington's thought [of a "clash of civilizations"] is an interesting idea. There is some truth in it. But as it is represented by the international media, it has become an idea that only paves the way to more fights and more killings. The West kills more Muslims they are afraid of or embarrassed by and say, "It's a clash of civilizations." It is not a clash of civilizations. It is just killing people. People with different origins, ethnic backgrounds, opinions, races, religions, even with a history of fighting each other, should and can live together. This is an ideal I believe in. You may say, "Oh, naive Orhan, they can only kill each other." But I don't want to believe that humanity is that bad. I don't think Palestinians and Israelis can live happily in the same street and kiss each other for at least another 50 years. But Kurds and Turks have been living [alongside each other]. If the Turkish government is wise, they can continue to live [side by side] for quite a long time. So what I believe sometimes may contradict what happened in history. Cynics do not have ideals. I have ideals. I believe that this is possible and that's why I want Turkey to join the European Union, which has higher standards of respect for different cultures and multiculturalism. You may say, "You are naive--look at your book 'Snow.'" I have a character who lives through all these dilemmas. He naively believes, like me, in all these things and falls into politically bad situations. But I don't want a cynic's life. The Ottoman Empire realized coexistence to some extent. You can only run an empire with a sort of tolerance. Do not think that they were multicultural, like EU or American tolerance. They were totally different. It was inevitable. If you are running an empire, you have to be tolerant to minorities. What I respect most in the Ottoman Empire was that they did not impose Islam too much. They imposed Islam, but compared with [the extent that] the West [imposes its values], relatively less. An empire is always multiethnic. There has been a long history of confrontation between Western and Eastern cultures. Istanbul has been a powerful symbol of that confrontation and coexistence. Some people only point out the confrontations of cultures in their lives, give their energy to focus on confrontations. I always point out how harmoniously they come together. Some people go out and only see head-scarved girls and mini-skirted girls and the conflict. Some people go out and see how they do not notice each other and live in peace in the streets of Istanbul. It depends on what you want to see. But, yes, this is a country where all the contradictions are abundantly available and visible. Is that a bad thing or a good thing? Politicians, groups who want to get people's attention through cultural difference, through secularism and conservatism, dramatize these things. Turkey is more politically troubled than socially troubled. If there is a social problem, that is poverty--class distinction between the rich and the poor. But politically, the representatives of the secularists, who are heavily embedded in the state apparatus, secularists and the army, are clashing with the popular Islamic voters. And this clash is really harming the country. Both sides are responsible for it. And most of the time lower classes and women suffer from it. Islamic boys can go to universities, but women cannot if they wear head scarves. Islamist politicians go into the parliament and enjoy life, but women cannot if they wear head scarves. The suffering of lower classes is not represented in the media. Turkey's first problem is that there is so much class difference between a very rich, leading bourgeoisie, making 50 percent of the national income, and the immense poverty. This real conflict is expressed through secularism, Islam and the army, and this kind of politics. Turkey is a multicultural country, not politically but ethnically and religiously. But I do not only see these problems as East clashes with West. Only after September 11th was "clash of civilizations" set as a sort of a standard model for the world. While more then 99 percent of the population is Muslim, the state is secular. Some say this secularism has reached its limit. Don't you think this secularism is unnatural? You are defending the argument of fundamental Islamists or fundamentalist secularists. There are fundamentalist secularists who think Islam is the problem, but I do not think so. There are also Islamic fundamentalists. Your opinion is valid and very popular in Turkey. But I disagree. Yes, Islam is a religion which does not stay in the private sphere. It is not only about personal beliefs, but also about how to run a country, about laws and governments. And the rules are in the traditions of Islam and Koran. But this is the argument of ultraradical secularists, which can only base its power on the force of the army. Many people like me think that most of the Turkish people believe at the same time both in a blend of secularism and a blend of Islam. I believe in secularism. I believe that public life should not be ruled by the laws of the religion. But Islamic tradition is not like that. Up to now, public life in Turkey has not been ruled by the rules of traditions of Islam, but the rules of secularism. I am a secularist, but a liberal secularist. There should be a harmony between the people's wishes and secularization energy. Turkey's secularists should be also liberal. We have secularists who base their power only on the army. That damages Turkey's democracy. Once in 10 years we have a military coup. In the last 10 years we have not had one, thank God. But every day, the army says don't do this, don't do that. I don't like that. But it doesn't mean you are an Islamic fundamentalist. I am also troubled by the raise of political Islam. So I am squeezed by two sides, but I don't have to take a side. Secularism is now combined with nationalism in Turkey. This combination has depressed ethnic minorities including Kurds, Armenians and Christians. There is an obvious rise of nationalism in Turkey. There are many reasons for that. One is the anxiety of those ruling classes who think that if Turkey joined the EU, their interests will be damaged. Another is that, unfortunately, some part of the Turkish Army is upset about negotiations with the EU. Turkey's improvement in democracy is developing in parallel with Turkey's relationship with the EU. Some measures were taken by the previous and present governments, which I am happy about. More freedom of speech, more respect for minorities, more multiculturalism--unfortunately half of them are done just to enter the EU. 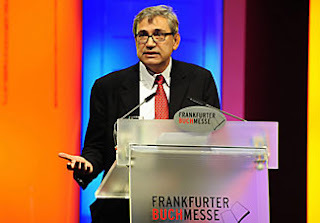 Pamuk also discusses the European Union, criticizes those European conservatives who regard the EU as a "Christian club," and talks of the importance of Turkey preserving its traditional culture alongside a more liberal and less militaristic state. For a look at Pamuk's take on literature, see his recent contribution, "My Turkish Library," in the New York Review of Books.